Dinara is the highest mountain in Croatia, and one of the most picturesque mountains in Dalmatia and in the Dalmatian hinterland. Even though it is not particularly high – not even exceeding the 2000-meter mark – it still represents one of the most impressive Croatian mountains with its shape and length. Its impressive massif, 20 kilometers long and almost 10 kilometers wide, rises as a natural boundary between Dalmatia and Bosnia, dividing two different worlds – the Mediterranean and the continental – like a wall of some sort. Dinara is not only the name of the highest Croatian peak, but also of an extraordinarily beautiful mountain. The size of its southwestern face, several hundred meters high, impresses and attracts everyone who finds oneself at its base. Lush flowering meadows and dense forests, quite unusual in arid karst, only add to the beauty of the mountain. The name of Dinara became a symbol of the largest mountain chain in the Balkans. In classical antiquity, the mountain was called Adrion oros. The origin of the mountain's current name is unclear, but it most probably represents a historical trace of the Illyrian tribe of Dindari that lived on the eastern side of the mountain. In the city of Knin, sites worth seeing are the Knin fortress on top of the rock rising above the city, and the cascade called Krčića slap not far from the source of the Krka River. In the process of preparing a hiking tour route along the mountain of Dinara (which is designed, but not yet implemented), part of the plan is to mark a direct trail route from the locality of Krčića slap towards Badanj and Brezovac. Until then, however, the main starting point for a climb to Dinara from the direction of Knin is Suvo polje – a large plateau located roughly at one half of the overall mountain elevation. Arriving by car from Knin, we first need to reach the road bend located at the village of Kovačić (on the outskirts of Knin), and then we proceed from there to the hamlet of Jelići (for 1.5 kilometers in the direction of Grahovo). Once in Jelići, we take the narrow road to the right, leading through the hamlet of Guge towards Dinara. Right behind the last house in Guge, the asphalt section ends, and the Dinaric road turns to the right across a small bridge. What follows is 18 kilometers of ascent along a wide gravel road, occasionally steep and poorly maintained, all the way to Suvo polje. The road to Suvo polje and Markov grob is in poor condition, but passable for cars and buses; from that point onwards, only all-terrain vehicles can use the road. 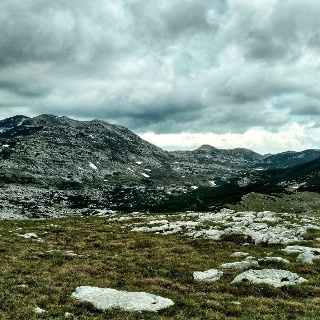 One can also reach Suvo polje from Guge on foot, by following the markings that shorten the route compared to the road option; however, that approach is long and hard. At the beginning of Suvo polje, on a site called Markov grob, there is a large widening suitable for parking. From Suvo polje, we can get a clear view of the impressive southwestern rocky slope of Dinara, and to the left of it, the picturesque peak of Badanj with the access route to Brezovac leading next to it. The markings take hikers across meadows, and then along the supply road that leads towards Brezovac, taking 1 hour and 30 minutes to get to the base of Badanj. The route bypasses Badanj to the left, and then it descends to the karst valley of Brezovac for 20 minutes. There is a mountain hut located at the right edge of the valley. Climbs to the peak of Dinara require good fitness level, since access routes are long, steep and hard. 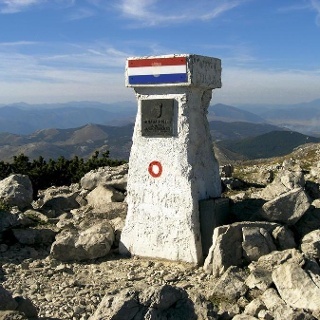 In order to popularize the mountain of Dinara, the Croatian Mountaineering Association organizes a group hiking tour to the peak of the mountain every year, in cooperation with the mountaineering societies from Knin and Kijevo. Mountainhouse Brezovac: the cystern is locked (when the shelter is closed). This is an important watersource for thru-hikers and we cannot arrange in advance that we're coming by. The next cystern is at Skloniste Martinova, at the other side of the Dinara. I got water from a barrel at a nearby holiday cottage that's being renovated- this was luck.